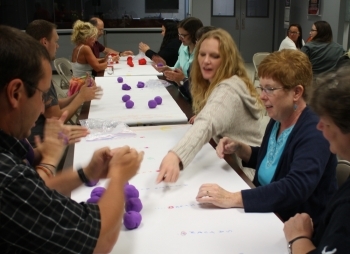 This intensive week-long graduate-level course is for PreK-12 educators, and provides space-related science, technology, engineering and mathematics (STEM) content that is instantly transferable to the classroom. All of the Space Foundation Space Across the Curriculum courses focus on national standards and STEM principles. Although the underlying concentration is on STEM, the courses are structured to adapt lessons to all grade levels and all curriculum areas. Participants do not need to be science or math teachers, and public, private and homeschool teachers from around the globe are welcome. This course focuses on providing teachers with hands-on activities to help students of all ages understand the motions of the galaxy, stars and constellations, astronomical research tools, 3D exploration of comets, auroras and planets. The course will also include a night of planet and stargazing with telescopes.